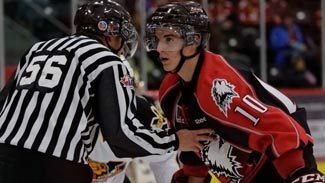 It wasn't quite a my-way-or-the-highway offer, but when Rouyn-Noranda Huskies coach Andre Tourigny sat down with forward Jean-Sebastien Dea in late December last year, he had a simple message for his young forward: Play our way or you won't be playing. Dea took the message to heart, finished last season on an upswing and has had an explosive start to the 2012-13 season. With a goal and an assist Friday against Drummondville, Dea leads the Quebec Major Junior Hockey League with 16 goals and 26 points in 12 games. After going undrafted last year, the 18-year-old center rapidly is becoming a hot commodity. "I'm really more popular because of him," Tourigny told NHL.com. That didn't sound like something that would happen at the start of last season. Dea, a third-round pick of the Huskies in the 2011 QMJHL draft, said when he joined the team he was overwhelmed by the level of play and struggled to keep up. "I was surprised how the hockey was so good and I have to work harder every day," Dea told NHL.com. "There were better players than me at this time. I had no confidence. It was hard to arrive at the rink and be positive every day. It was a tough time." Dea played sparingly early in the season, and with the winter holiday break approaching, Tourigny decided it was time for some honest talk with his player. "Last year we mentioned a lot of stuff at J-S at the start," Tourigny said. "It was about the way he supported the puck carrier, was about the way he got himself into battles … all of that. The way he got involved in battles, the way he was supporting his partners. He was really slow on that. At some point we repeated that and J-S was not buying in. At some point last year, at Christmas, we had a discussion and I told him unless you do that you're not playing any more -- period." Rather than sulk at his coach's harsh tones, Dea took what Tourigny said to heart and pledged to follow orders. "He told me the full truth, what I really had to do to be in the lineup," Dea said. "He told me I have to work harder to get in the lineup and help my team. I started working harder and harder and I got my spot in the lineup for the rest of the season." Tourigny said, "It was a turnover for him and for me. We put the base of what we'll accept and what we won't accept. After that I was maybe more tough on him on those details, but at the same time I think it was good for him. Now he's playing really good hockey with that. And when he starts to go away from that game I tell him right away. He knows what he has to do. Now he knows and he wants to do it because he sees the success he has with it. It's an easier job for myself and it paid off for him, so that's the best scenario." Dea played 23 of the Huskies' 39 games before Christmas, totaling five goals and three assists. When play resumed, Tourigny gave Dea a chance to prove himself -- and he did. He had four goals in his first seven post-Christmas games; then came Feb. 12 against Cape Breton, when Dea was promoted to the top line and responded with his best game to that point: two goals and two assists. "That was the key point in my career in junior," Dea said. He finished the season with 12 goals and 12 assists while playing 27 of the Huskies' final 29 games. That finish laid the foundation for his stellar start to 2012-13. "We knew his ability, his capacity to score, his hockey sense," Tourigny said. "He grew 2 inches and 10 pounds over the summer [to 6 feet tall and 155 pounds]. I knew he was bigger. I'm not surprised [at his start]. I cannot say I was expecting him to score more than a goal a game, but I'm not surprised by the fact he's had a lot of success." That success has led to a QMJHL player of the week award and his selection to Team Quebec for the Subway Super Series games against Team Russia, to be played Nov. 5 and 7. "It's nice," Dea said. "I'm very proud to represent the QMJHL. I watched [the Super Series games] last year. There's big players, players that are drafted in the NHL -- not in the seventh round, but the first round. It's an honor for me. It's nice to be part of it and show what I can do … show I can be a good player with all those other good players." Tourigny, who will coach Team QMJHL, said the Super Series opportunity is another example of what Dea can accomplish if he plays the right way. "He told me the full truth, what I really had to do to be in the lineup. He told me I have to work harder to get in the lineup and help my team. I started working harder and harder and I got my spot in the lineup for the rest of the season." "The [Super Series] invitation is reward to him, payoff for the effort and the commitment he has in the past year," the coach said. "It's real good and at the same time it's a good message for him. If he keeps battling like that, if he keeps playing like that, good things will happen. I'm really happy for him." Another byproduct of his strong start is that more scouts are paying attention to him, and the chance to hear his name called sometime on draft weekend in June 2013 is increasing. But rather than wilt from the extra attention, Dea said he's enjoying the additional eyeballs looking at him. "I'm just trying to take that spotlight on me and … I think it's just helping me to be better and help me arrive at the rink and have more confidence," he said. "There's a smile on my face every day. Not like last year when I arrived with my head down because I was not playing. It's just helped me be a better player. I see it in that way." To keep that smile on his face, Dea knows he can't let up. He's set the bar with his fast start; now he has to keep pace at or near that level over a full 68-game season. "I'm trying to not put pressure on me," he said. "Just day by day, game by game, work hard every game. I try to do my best to help the team to win."